The International Space Station (ISS) is a multi-nation construction project that is the largest single structure humans ever put into space. Its main construction was completed between 1998 and 2011, although the station continually evolves to include new missions and experiments. It has been continuously occupied since Nov. 2, 2000. As of January 2018, 230 individuals from 18 countries have visited the International Space Station. Top participating countries include the United States (145 people) and Russia (46 people). Astronaut time and research time on the space station is allocated to space agencies according to how much money or resources (such as modules or robotics) that they contribute. The ISS includes contributions from 15 nations. NASA (United States), Roscosmos (Russia) and the European Space Agency are the major partners of the space station who contribute most of the funding; the other partners are the Japanese Aerospace Exploration Agency and the Canadian Space Agency. Current plans call for the space station to be operated through at least 2024, with the partners discussing a possible extension until 2028. Afterwards, plans for the space station are not clearly laid out. It could be deorbited, or recycled for future space stations in orbit. The space station flies at an average altitude of 248 miles (400 kilometers) above Earth. It circles the globe every 90 minutes at a speed of about 17,500 mph (28,000 km/h). In one day, the station travels about the distance it would take to go from Earth to the moon and back. The space station can rival the brilliant planet Venus in brightness and appears as a bright moving light across the night sky. It can be seen from Earth without the use of a telescope by night sky observers who know when and where to look. You can use our Satellite Tracker page powered by N2YO.com to find out when to see the space station. 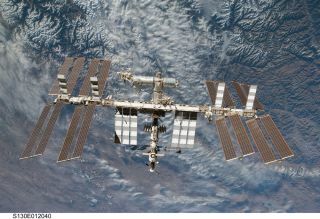 The ISS generally holds crews of between three and six people (the full six-person size was possible after 2009, when the station facilities could support it). But crew sizes have varied over the years. After the Columbia space shuttle disaster in 2003 that grounded flights for several years, crews were as small as two people due to the reduced capacity to launch people into space on the smaller Russian Soyuz spacecraft. The space station has also housed as many as 13 people several times, but only for a few days during crew changeovers or space shuttle visits. The space shuttle fleet retired in 2011, leaving Soyuz as the only current method to bring people to the ISS. Three astronauts fly to the space station in Soyuz spacecraft and spend about six months there at a time. Sometimes, mission lengths vary a little due to spacecraft scheduling or special events (such as the one-year crew that stayed on the station between 2015 and 2016.) If the crew needs to evacuate the station, they can return to Earth aboard two Russian Soyuz vehicles docked to the ISS. Starting in 2019 or 2020, the commercial crew vehicles Dragon (by SpaceX) and CST-100 (by Boeing) are expected to increase ISS crew numbers because they can bring up more astronauts at a time than Soyuz. When the U.S. commercial vehicles are available, demand for Soyuz will decrease because NASA will purchase fewer seats for its astronauts from the Russians. Astronauts also participate in testing out commercial products – such as an espresso machine or 3D printers – or doing biological experiments, such as on rodents or plants, which the astronauts can grow and sometimes eat in space. Crews are not only responsible for science, but also for maintaining the station. Sometimes, this requires that they venture on spacewalks to perform repairs. From time to time, these repairs can be urgent — such as when a part of the ammonia system fails, which has happened a couple of times. Spacewalk safety procedures were changed after a potentially deadly 2013 incident when astronaut Luca Parmitano's helmet filled with water while he was working outside the station. NASA now responds quickly to "water incursion" incidents. It also has added pads to the spacesuits to soak up the liquid, and a tube to provide an alternate breathing location should the helmet fill with water. Most consecutive days in space by an American: 340 days, which happened when Scott Kelly took part in a one-year mission to the International Space Station in 2015-16 (along with Russian cosmonaut Mikhail Kornienko). The space agencies did a comprehensive suite of experiments on the astronauts, including a "twin study" with Kelly and his Earth-bound former astronaut twin, Mark. NASA has expressed interest in more long-duration missions, although none have yet been announced. Longest single spaceflight by a woman: 289 days, during American astronaut Peggy Whitson's 2016-17 mission aboard the space station. Most total time spent in space by a woman: Again, that's Peggy Whitson, who racked up most of her 665 days in space on the ISS. Most women in space at once: This happened in April 2010 when women from two spaceflight missions met at the ISS. This included Tracy Caldwell Dyson (who flew on a Soyuz spacecraft for a long-duration mission) and NASA astronauts Stephanie Wilson and Dorothy Metcalf-Lindenburger and Japan's Naoko Yamazaki, who arrived aboard the space shuttle Discovery on its brief STS-131 mission. Longest single spacewalk: 8 hours and 56 minutes during STS-102, for an ISS construction mission in 2001. NASA astronauts Jim Voss and Susan Helms participated. Longest Russian spacewalk: 8 hours and 13 minutes during Expedition 54, to repair an ISS antenna. Russian astronauts Alexander Misurkin and Anton Shkaplerov participated. The space station, including its large solar arrays, spans the area of a U.S. football field, including the end zones, and weighs 861,804 lbs. (391,000 kilograms), not including visiting vehicles. The complex now has more livable room than a conventional five-bedroom house, and has two bathrooms, gym facilities and a 360-degree bay window. Astronauts have also compared the space station's living space to the cabin of a Boeing 747 jumbo jet. The International Space Station was taken into space piece-by-piece and gradually built in orbit using spacewalking astronauts and robotics. Most missions used NASA's space shuttle to carry up the heavier pieces, although some individual modules were launched on single-use rockets. The ISS includes modules and connecting nodes that contain living quarters and laboratories, as well as exterior trusses that provide structural support, and solar panels that provide power. Canadarm2 robotic arm (CSA; launched 2001). It was originally used only for spacewalks and remote-controlled repairs. Today it also is regularly used to berth cargo spacecraft to the space station – spacecraft that can't use the other ports. Besides the space shuttle and Soyuz, the space station has been visited by many other kinds of spacecraft. Uncrewed Progress (Russia) vehicles make regular visits to the station. Europe's Automated Transfer Vehicle and Japan's H-II Transfer Vehicle used to do visits to the ISS as well, until their programs were retired. NASA began developing commercial cargo spacecraft to the space station under the Commercial Orbital Transportation Services program, which lasted from 2006 to 2013. Starting in 2012, the first commercial spacecraft, SpaceX's Dragon, made a visit to the space station. Visits continue today with Dragon and Orbital ATK's Antares spacecraft under the first stage of NASA's Commercial Resupply Services program. Dragon, Antares and Sierra Nevada Corp.'s Dream Chaser all have received CRS-2 contracts expected to cover flights between 2019 and 2024. Additional reporting by Space.com Reference Editor Tim Sharp.